Food Lion Hunger Relief Day, our annual benefit for the Food Bank of Central and Eastern North Carolina, is Thursday, Oct. 20, when fairgoers can bring four cans of Food Lion brand food to the fair in exchange for admission to the fair for that day. Agriculture Commissioner Steve Troxler wants this year to be the largest food drive yet, and he’s willing to put some money on it. If fairgoers break last year’s record of 247,569 pounds of canned food, the fair will donate $1,000 to the food bank. If collections top 275,000 pounds, the fair will kick in $2,500. And if collections reach 300,000 pounds, the fair will donate $5,000 to the food bank. Food bank personnel say each dollar collected helps fund four meals. A donation of $5,000 would fund 20,000 meals. So, if you plan on attending Food Lion Hunger Relief Day Thursday, so please bring a few additional cans. If you didn’t plan on coming out to the fair Thursday, change your plans and help us get to 300,000 pounds. 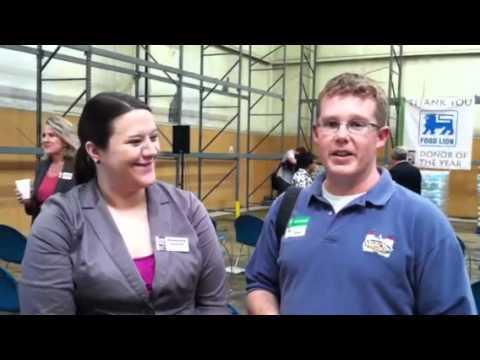 Fairgoers donated more than 247,000 pounds of food during the 2010 Food Lion Hunger Relief Day. This year, we're hoping for 300,000. 2011 N.C. State Fair, Agriculture Commissioner Steve Troxler, challenge, Food Bank of Central and Eastern NC, food drive, Food Lion Hunger Relief Day, hunger. Bookmark.